Charleston’s restaurant scene is as dynamic as ever. It’s been great getting back into the swing of things here and re familiarizing myself with old favorites, and finding new ones. When I left Charleston in 1999, the so-called “Upper King Design District” consisted basically of King Street Skates and Miss Alice’s Fine Foods. Needless to say, the change has been dramatic. The newest addition to the dining scene of upper King is The Grocery, located at 4 Cannon St. in the old Altman’s Furniture building. Chef – Owner Kevin Johnson has been busy with a transition to what promises to be a singular dining experience. The design and layout was overseen by architect David Thompson, who did an amazing job with the place. David’s use of re-purposed materials throughout the restaurant suggest The Grocery aesthetic instead of beating you over the head with concepting. The open kitchen is set back off a line of banquettes and framed with cabinetry filled with house cured pickles and colorful Le Creuset cookware. A rolling ladder, such as those found in turn of the century groceries allows access to the preserves stored there. The glass door reach in refrigerator to the left of the line hosts Kevin’s house – cured charcuterie, similiar to what San Francisco Chef Chris Cosentino has done at his Boccalone in the Ferry Building – bacon, pancetta, and a unique smoky – sweet pastrami cured ham. The private dining room inside The Grocery accommodates up to 20 and features a really cool HUGE handmade lighting fixture evocative of a backyard fire pit. While the kitchen line is as lean as efficiency demands, the highlight here is The Grocery’s wood fired oven. The internal temperature can surpass 600f and the flames are visible from the street. Ironic then that the restaurant’s beautiful floor – to – ceiling windows look out across Cannon to the home of Charleston Fire Station 7, presently housing Engine 6. Built following the historic 1886 earthquake, the station maintains the fire watch tower original to the location. Kevin recently found a turn of the century black and white photo of the fire station that will be the perfect compliment to their location. Meet Executive Chef Kevin Johnson! Followers of fine dining may find Kevin Johnson a familiar name as he has a long pedigree in Charleston. 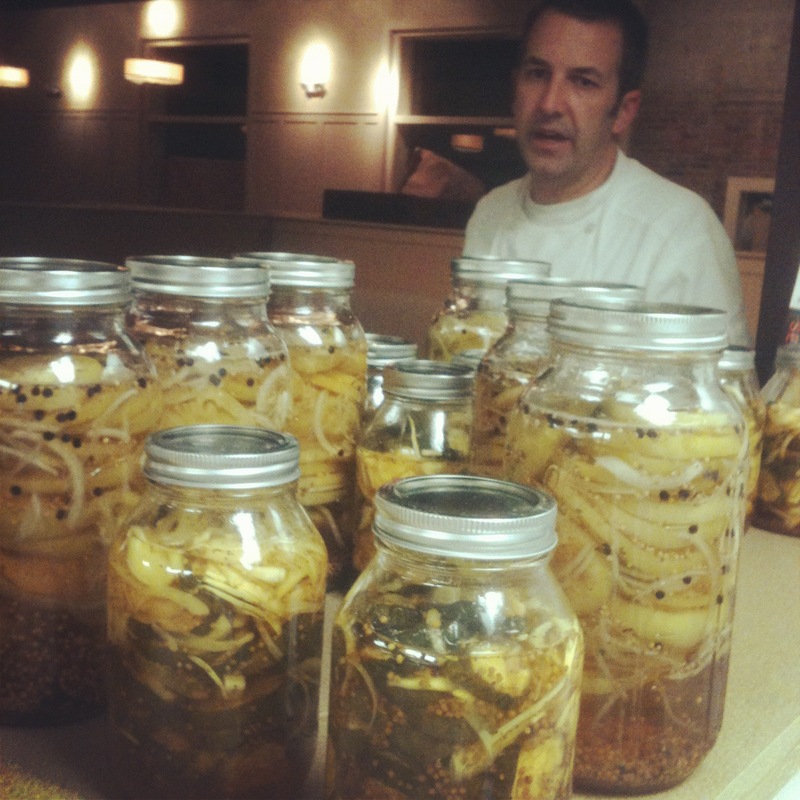 Kevin began his journey with Chef Frank Lee and Maverick Southern Kitchens at S.N.O.B, where he worked firsthand with some signature products and techniques, framed by tradition with a new edge. 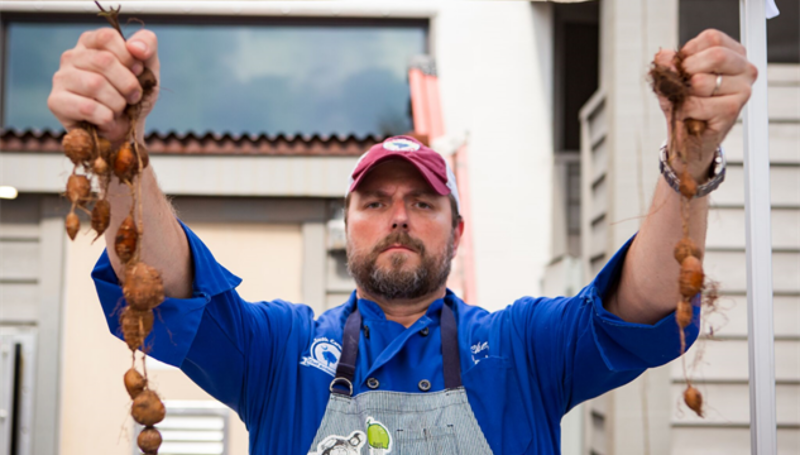 Kevin then left the Lowcountry when an opportunity arose to work as a sous chef at the acclaimed Relaix and Chateau Inn at Little Washington with direction from Patrick O’Connell. Kevin worked intently for three years, rocking Patrick O’Connell’s signature “Dalmation” chef’s pants. He recalled to me remembering receiving 40 pounds of black winter truffles at one point during his work there. I can only imagine the hands on education Kevin must have had being able to work with the pristine product for which the Inn at Little Washington is famed. Like myself, Kevin was eventually lured back to the Lowcountry, and settled in at the helm of the venerated Anson. Doing the math, he at one point calculated that over the course of six years, he had personally plated over 12,000 of just one of Anson’s signature entrees. He made his way to the Rev group (Taco Boy, Closed for Business, Monza, Poe’s) as a Corporate Executive Chef for a couple years leading up to The Grocery.